Our 30′ x 30′ Pole tent rental options come in a variety of colors and are great for weddings, corporate events, graduation parties, birthday parties and more. 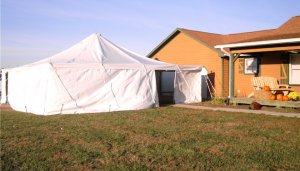 All of our tent rental options are made of high quality material, regularly cleaned and are set up for your event! They are made up of block out material which shades your guests and keeps them cool during those hot summer days.